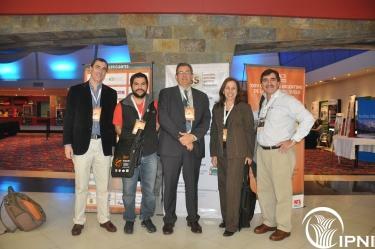 Speakers at the XXVI Soil Science Society of Argentina meeting. Rising atmospheric carbon dioxide (CO2) concentration will result in drier and warmer conditions across much of the mid-latitudes, including Australia and New Zealand. Research at the Australian Grains Free Air Carbon Dioxide facility has shown that although yield increased due to improved C supply, wheat grain protein, baking quality and important micronutrients all decline. As well as affecting plant demand, higher atmospheric CO2 levels increases photosynthetic N use efficiency, although total N demand increases. We also observed the coupling of soil and atmospheric C cycles with enhanced plant growth leading to additional soil C input. N supply from legumes is enhanced under elevated CO2, provided that P and other nutrients are not limiting. So, the progressive decline in N as soil C:N ratio rises can be addressed through added legume phases and/or more efficient N supply. Future farming systems will require cultivars adapted to higher carbon dioxide levels and new combinations of nutrient source, rate, time and place to meet the change in the pattern of nutrient demand. Atmospheric carbon dioxide (CO2) has been rising since the industrial revolution, and at the present rate will reach about 550 μmol mol-1 by 2050. This increase, along with the consequent perturbations of climate will profoundly influence food production and farming systems. Higher CO2 levels are generally reported to stimulate growth in C3 plants, as well as reducing water use, termed the fertilization effect. Responses in C4 plants such as maize are smaller as C assimilation is already saturated through the Hatch-Slack pathway. For legumes, such as soy, the response is moderated by P supply, so that because these legumes are less N limited than C3 crops, their responses to CO2 are larger (Ainsworth and Long, 2005). The IPCC 5th Assessment summary (2013) report indicates that we can expect significant changes in the climate by 2050, and the degree of change will depend on future emissions scenarios. For Australia, using a medium scenario, by 2050 there is a median probabiltiy of summer temperatures 1-3oC warmer and winter temperatures 1-2oC warmer than 1986-2005. Rainfall is expected to decline by 10% over summer and winter. Similar temperature changes are predicted for south-eastern South America, but rainfall for the more southerly regions is indicated to be 10% lower. These climate perturbations will affect crop and pasture production systems, and an understanding of these impacts will enable interventions to be developed to assist in meeting our global challenge of meeting the growing nutritional demands of 9 billions people by 2050. Uncertainty about how the CO2 “fertilization” effect would interact with hotter and drier growing conditions led to the establishment of the Australian Grains Free Air Carbon Dioxide Enrichment (AGFACE) facility in 2007. Other FACE facilities have focused on higher rainfall areas or where irrigation is available. This paper provides an overview of the results from the AGFACE research group relating to soil nutrient cycling and wheat crop nutrition. The AGFACE facility is at Horsham (36.7519oS, 142.1144oE) in southeastern Australia. The facility has 8 elevated CO2 FACE rings (~550 μmol mol-1) and 8 control (~385 μmol mol-1) rings with 12 m rings and 12 plots each 4 m by 1.7 m per ring (2007/2008) or 16 m rings wth 24 plots (after 2009). These main CO2 effects are combined with different water supply (by irrigation), temperature during grain fill (by altering sowing time), nitrogen (by fertilizer) and cultivar. CO2 was injected over the crop in open-air rings from emergence until maturity in 2007, 2008 and 2009 (Mollah et al. 2009). Wheat (Triticum aestivum) Growth, yield, water use, grain mineral content and yield have been measured for each of the treatments and these data analysed as a factorial analysis of variance. The site has also hosted other research investigating N dynamics and grain quality (baking quality and micronutrient content). Initially two common cultivars were used but later this was expanded to investigate intraspecific responses to CO2 for both wheat and field pea (Pisum sativum) a common rotation crop in southern Australia. The experimental design enabled responses to elevated CO2 to be assessed over a range of temperature and water supply within and between years. Elevated CO2 increased crop biomass at maturity by 22% (2007), 31% (2008) and 32% (2009). Mean grain yield of two common wheat cultivars (Yitpi and Janz) increased on average from 252 g m-2 to 322 g m-2 when grown under elevated CO2 (Table 1). Sowing time and additional water affected growth and yield with the later sowing showing no response to higher CO2 in one of the three years (2008.) In two of three years, kernel weight increased with higher CO2 although there was no consistent change in other yield components (Norton et al. 2010). The increase in growth generally occurred during the spring rather than the cooler winter months. An important outcome of the research is that the stimulation occurs in most situations, even under warmer and drier climates. Harvest index – the ratio of grain to growth was not affected under eCO2 but the drier and hotter conditions are likely to adversely affect this ratio leading to crops “haying off” (Nutall et al. 2012). When grown under elevated CO2, plants had lower tissue N content particularly later in growth, but there were few interactions with temperature, water or cultivar. For example, in 2008 leaf N concentration at flowering declined from 3.8% to 3.5% (p<0.00) (Norton et al. 2010) although the lower leaf N content did not compromise photosynthetic capacity as the main photosynthetic enzyme (RubisCo) activity increased (Thilikarthne et al. 2013). As a result of the small decline in leaf N content and an increase in C assimilation, photosynthetic N use efficiency increased with elevated CO2. At a crop level, this means that the N accessed is used more efficiently, but even further gains could be possible if leaf N contents were not reduced and the concentration of RubisCo maintained with a higher C assimilation activity. Grain protein at maturity declined significantly in nearly all situations under elevated CO2 (Table 1). Fernando et al. (2012) showed in one cultivar that protein declined from 15.5% to 13.5%. It is important to understand the mechanism behind this change, so that new cultivars and management systems can be designed to minimise this decrease. For example, Fernando (2013) showed that wheat supplied with ammonium-N showed a smaller protein decline as those supplied with nitrate-N. Despite this, the demand for N increased due to the stimulation of growth, which may be a consequence of reduced plant N causing less remobilisation from the leaves to the grain during grain filling. When averaged across all the experimental treatments, elevated CO2 increased crop N removal by 20% (Lam et al. 2012). This indicates that added N will be required by crops growing in future carbon dioxide rich climates. Studies of the effects of elevated [CO2] on soil N processes have indicated that the increased level of plant demand is not always able to be met by soil processes and as a result, across time, N becomes more limiting, an effect termed ‘progressive nitrogen limitation’. Progressive N limitation (PNL) is closely linked to potential C sequestration under higher CO2 (Schlesinger and Litcher, 2001) and PNL occurs when the availability of mineral N declines across time at elevated [CO2] in comparison with ambient [CO2] if there is no new N input or there are larger N losses such as in grain removal. The result is a gradual decrease in the [CO2]-induced increment in ecosystem C storage (Luo et al., 2004) so that the actual response of these systems estimated from the potential carbon dioxide response is significantly less than if N was not limiting. Table 1. The effect of elevated CO2 on the grain yield and grain N content of wheat from the AGFACE experiment. All means within a year are significantly different (p<0.05). Elevated CO2 did not affect the efficiency at accessing fertilizer N, and in the AGFACE there was no evidence of differences in N mineralisation from crop residues (Lam et al. 2012a). Nitrogen fixation efficiency was not affected by eCO2, but legume growth stimulation meant that more N was derived from biological N fixation under elevated CO2 This response was dependant on an adequate P supply to the legume (Lam et al. 2012b). The relative value of legume derived N to subsequent cereals may be reduced under elevated CO2. However, compared to N fertilizer application, legume incorporation will be more beneficial to grain yield and N supply to subsequent cereals under future climates (Lam et al. 2013). There is no evidence that crops grown under eCO2 have a higher efficiency of P uptake or access to different soil P pools (Jin et al. 2013a). This was despite more microbial activity around the roots of plants under eCO2, probably due to increased production of root exudates (Jin et al. 2014). Of interest, Jin et al. 2014 reported that different N sources affected the ability of plants to access different P pools, with urea derived N more efficient at accessing less available hydroxy apatite P pools than nitrate derived N.
Concentration of grain S, Ca, Zn and Fe decreased in wheat grown under elevated CO2. This could not be fully explained by “yield dilution and the N:S ratio also declined (Fernando et al. 2012). As well as changing the amount of grain protein, the types of proteins also changes, which affects baking quality. The reduction in grain protein was correlated with Fe, Zn, and S concentration, so that elevated CO2 is likely to exaggerate worldwide Fe and Zn malnutrition for those on grain-based diets, although lower grain phytate concentrations may offset some of this decline (Fernando et al. 2012). If the overall impact of climate change, including the CO2 fertilization effect, increases crop yield potential, realising that potential will require additional inputs of all nutrients, including phosphorus, potassium, sulfur and the micronutrients. It has been shown that grain and pasture legumes will only respond to a higher atmospheric CO2 if phosphorus is not limiting (Newton et al., 2006; Lam et al., 2012a). Under P limitation, biologically fixed N input would be reduced and so contribute even further to the progressive limitation of N (Luo et al., 2004). St.Clair and Lynch (2010) also reached essentially the same conclusion in their review of the impact of climate change on nutrient demands – that nutrient limitations under warmer, drier climates seem likely to impact adversely on food security. The large and important uncertainty is how these climatic changes will affect labile N supply and how this will then interact with P demand (Newton et al., 2006), water availability and temperature (Hovenden et al., 2008). Thus, the increase in N-use efficiency suggested by Oaks (1994) from 22% to 55% as seen in plants grown under elevated CO2 is – as yet – uncertain and the development of strategies to balance the additional C with N, and other nutrients, is a topic of active research. It is difficult to upscale these results to national or international levels, as there are other challenges facing agricultural production most importantly the need to increase food quantity and quality to the extra 2 billion people by 2050, which at the same time ensuring a clean and healthy environment. These issues are not mutually exclusive, and good agricultural practice has positive outcomes for both production and the environment. With current C3 crops, 2050 atmospheric [CO2] could increase N demand by 20%, and that higher N demand will require balanced nutrition with extra P, K, S and micronutrients. This research identified that nutrient management strategies will need review under elevated CO2. As atmospheric CO2 rises, there will be a small increase in N use efficiency due to changing physiological responses in current germplasm. The pattern of growth, and therefore the temporal pattern of nutrient demand mean new combinations of the nutrient source, rate, time, and place will be needed, along with more efficient cultivars. Most important will be development of strategies to stop protein changes and so maximize the benefits of the extra carbon available. It is interesting to conjecture that crop yields would increase even further under elevated CO2 is the adaptive response of down-regulating N uptake could be overcome. Both genetic and agronomic approaches are important and This may be by changing to ammonium based N sources, use of foliar N around grain filling and by building on the current research that is developing more N efficient cultivars. This research is supported by the Australian Government, Grains Research and Development Corporation, the Victorian Department of Primary Industries and The University of Melbourne. The research reported here was the work of my colleagues S.K. Lam, S. Seneweera, N. Fernando, S. Tausz-Posch, M Tausz and D. Chen (University of Melbourne) and R. Armstrong, J. Nuttall, G O’Leary and G. Fitzgerald (Victorian Department of Environment and Primary Industries). Ainsworth, E.A., et al. (2002). Global Change Biology. 8:695–709. Ainsworth E.A. and Long SP. (2005) New Phytologist, 165, 351-372. Fernando, N., et al. (2012) Food Chemistry, 133, 1307-1311. Fernando, N. (2013) PhD thesis, The University of Melbourne. IPCC (2013) Working Group 1 Contribution. Annex 1 Final Draft. Hovenden, M. J et al. (2008) Global Change Biology 14, 1018-1024. Jin, J. et al. (2014) Plant Soil, 374, 109-119. Jin, J. et al. (2013) Plant Soil, 368, 315-328. Lam, S.K., et al. (2012a) Nut. Cyc. Agroecosys., 92, 133-144. Lam, S.K., et al. (2012b) Crop Pasture Science, 63, 53-62. Lam, S.K., et al. (2013) Plant Soil, 364, 81-91. Luo, Y., et al. (2004). Bioscience, 54, 731–739. Mollah, M. et al. (2009) Crop Pasture Science, 60 (8), 697-707. Newton, P.C.D., et al. (2006). In (J. Nösberger, et al. eds) Managed ecosystems and CO2: Case studies, processes and perspectives. Ecological Studies Series. Springer Verlag, Heidelberg, Germany. p157-171. Norton, R., et al. (2010) 8th International Wheat Conference Abstracts, 1-4 St Petersburg, Russia (Ed NI Dzyubenko). p142-143. Nuttall, J. et al. (2012) Crop Pasture Science, 63:595-605. St.Clair, S.P. and J.P. Lynch. (2010) Plant Soil, 335:101–115. Thilakarathne, L., et al. (2013) Functional Plant Biology, 40, 185-194.